We simplified the process of working together. You can access any forms, documents, and videos right here on this website. Your first step is to fill out the form so we can have a meeting. Second, I come and deliver an outstanding presentation. And third, you become the hero for hosting an excellent event. How easy is that! Access all the items you need here...including Kon's Bio and Intro, AV Requirements, Speaking Topics, Highlight Reels, and more. As a meeting planner, your decision on hiring a speaker is one of the most important you can make. And often, it’s on someone you’ve never met or even heard speak. That’s why it’s key to bring someone in who has a wealth of experience in various venues with diverse audiences from 10 to 1000’s. 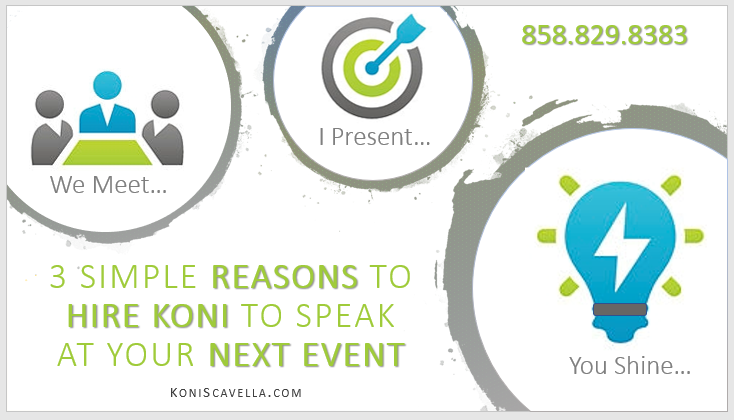 Dr. Koni Scavella is a professional speaker. That means it’s not her hobby. Her job at your event is to make you look great and to deliver a world-class presentation. Event planners around the globe trusted Koni to inspire, motivate, entertain, and educate their audiences with an unprecedented 100% satisfaction rate. WE MAKE IT SIMPLE: We Meet. I Present. You Shine.